Where do you stay? Pitcaple, near Inverurie. Do you hold any office bearer roles at Young Farmers? I am vice-chairman. What’s your background in agriculture? I’m not directly off a farm but have always been around it from a young age with a farm on my mother’s side of the family and my uncle being a livestock floater for many years. I was in a boiler suit at any opportunity so it was a decision I made very early on in life that I was determined to be involved in agriculture. After studying an HND in agriculture at SRUC Craibstone I set myself up self-employed providing labour to farmers in Aberdeenshire. I have a few farms which I provide a regular service to but I’m always willing to take on new customers. Being self-employed is a great way to gain experience of different farming practices as no two farmers work the same way. I’m very grateful to the people that have given me opportunities to develop and learn new skills. Life’s not all about money; if you enjoy what you do every day that’s the main thing. Of course there are days when everything goes wrong whether it be machinery not behaving or poorly stock or even the weather changing all the plans for the day. Sometimes you just can’t wait to get home but as long as the good days outweigh the bad days then you’re on to a winner. Going out in the lorry with my uncle visiting farms all over Scotland really got me addicted to the farming way of life. I remember going out in the lorry at any opportunity and the excitement of being told we were going for a full load of sheep – there was nothing better than getting stuck in loading the float. You have to sacrifice a lot at certain times of year and put in a lot of hard work and hours but I couldn’t imagine life any other way. We all grow up playing with a tractor at some point and for the lucky ones we still do, even if they do cost a wee bit more and are a tad bigger. As a young lad seeing farmers care and work with their stock also really got me interested in the livestock husbandry side of things. During my years at Craibstone I did three lambings at a farm near Huntly and this is really where I learnt to lamb. The focus was always on sheep welfare. The farmer’s wife was always the go-to person at lambing time and she taught me a tremendous amount of things I will never forget. I don’t understand these people from the town that say farmers don’t care about their stock. If being in a lambing shed for 20-plus hours a day, or putting every last bit of energy in to lambing a difficult ewe in the middle of the night in the freezing cold isn’t caring for your stock, I don’t know what is. What is the most rewarding thing about working in the farming industry? I feel the most rewarding thing for me is taking cattle in for the winter on to a fine new bed of straw and then seeing them race up the park after coming off the float in spring. Bringing new life in to the world is also a great privilege. I don’t think I will ever get bored of helping a newborn lamb take its first few breaths and watching its tail wag as it takes its first sook of milk. As rural youth, do you think there is something we should be doing additionally or differently within the agricultural sector? More opportunities for young people to start up farming. Unless you are born in to a farm it is near impossible to get yourself a reasonable acreage you can make a living off. 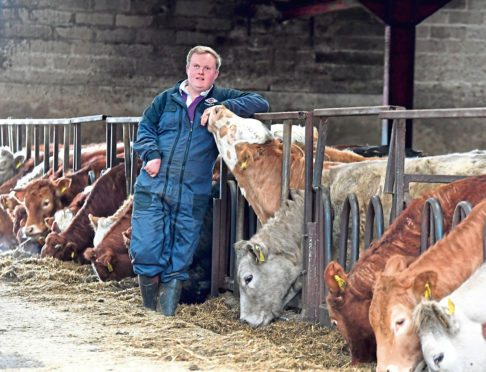 Whether it be help from banks, the NFU, local councils or estates, the farming industry is in need of new blood and with less young people taking on the family farm some of it will have to come from people with less of an agricultural background. The more that’s available to help get people started, the better. Where do you see the farming sector in 10 years’ time? I think it is very difficult to tell where the industry will be in a year’s time let alone 10 but I hope to see small and medium-sized farms thriving and I would also like to see more opportunities for folk not from farm backgrounds to get in to the industry. I also think there will be an increase for the need of self-employed labour as farming runs on very tight margins and with the progression of automation in both field and livestock work the manual inputs on a farm on a day-to-day basis is only going to decrease which could lead to job losses for full-time farm workers and the need for a self-employed worker to come in only for the hours required to do specific jobs. With machinery getting more and more technically advanced the cost of purchase also increases as well as maintenance costs as there isn’t much you can do to a modern piece of machinery nowadays without a callout for an engineer with a laptop from the dealer. I think this could result in farmers sharing seasonal machinery and using agricultural contractors more frequently. If you could pass on one piece of advice to someone looking to get into the sector what would it be? If you are really passionate about farming don’t give up, it might not work out the first few times but you’ll find someone willing to give you a chance. It’s definitely not an easy job but I’m a strong believer in that if you do a job you love you’ll never work a day in your life. Why did you join Young Farmers? I was asked along to the new members’ barbecue back in May 2012. It was an afternoon of food and games and a great chance to meet some of the members and find out exactly what the club did during the year from stockjudging, machinery evaluations and various trips. Not long after that I became a member. It’s been non-stop from there. Every year you’re trying new things and learning something new and taking on different responsibilities within the club. What do you most enjoy about Young Farmers? I enjoy meeting up with everyone and getting a catch up on what everyone’s doing and seeing inside lots of different places that you wouldn’t get to see. I also really like being involved with putting on fundraising events and helping out the local community where we can. The competitions are also great. There’s everything from stockjudging, football, tug o’ war, rope making and a whole lot more. There really is something for everyone to have a go at. How has Young Farmers impacted your life? Since I joined Young Farmers I am a totally different person. My confidence has grown greatly as well as my knowledge of agriculture and the issues surrounding it. I have made friends for life in Young Farmers and I will never forget some of the things we’ve done and places we’ve seen. The best thing about Young Farmers is you get out what you put in. The more committed and passionate about the things you are doing in the club the better the experience is going to be. Any advice for someone looking to join? There is absolutely nothing to lose by going to a meeting and seeing what you think. It can open so many doors into the industry for someone keen and enthusiastic.